Anui performs extremely well off the wind and because of her dagger-boards will sail upwind faster than most mono-hulls. 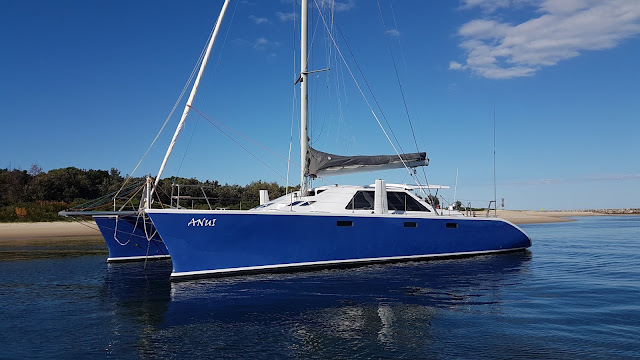 Australian registered, she has taken her current owners to many beautiful locations around Australia and beyond with proven 250+ miles a day or an extremely comfortable 10 knot average is common. 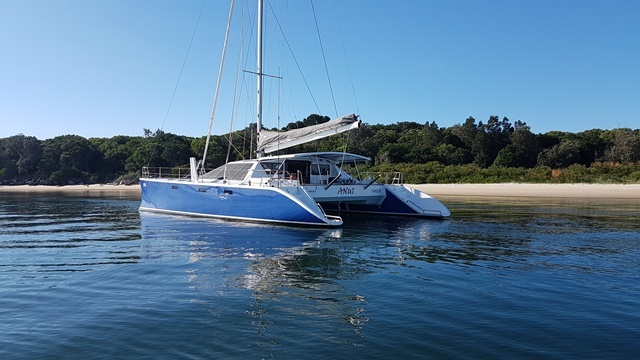 Due to her clever deck arrangement she is easily sailed by one a couple or by a family. DRAUGHT: 1.2mtr boards up. 2.5mtr boards down. Vinyl-ester GRP over Divinycell foam. Australian Red Cedar vacuum bagged over Divinycell foam. 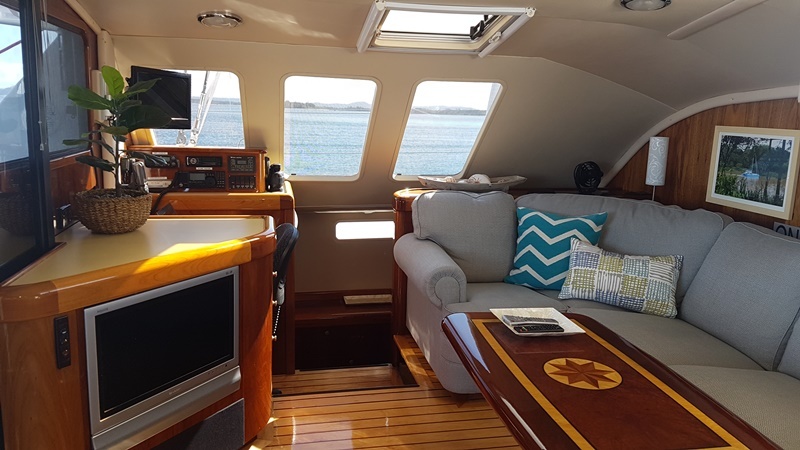 No expense or time was spared on Anui’s Hi-gloss Australian Red Cedar fitout. It creates a beautiful, yet light weight and durable fitout. No sharp corners, only beautiful flowing curves. Canadian Rock Maple/Jarrah floors. Anui’s portside owners’ hull has a double cabin and walk in wardrobe forward with ample storage in the mid- section for live-aboard necessities. Aft is a large bathroom with separate toilet. Starboard hull has double cabin forward with en-suite and the aft cabin has a single and kids size bunk. All have lots of drawers and lockers for storage. The mid- section is dedicated to storage for spares and a huge tool cupboard with room for a washing machine. Making the most of Anui’s 8.2mtr beam the almost house size galley is up on the bridge-deck. 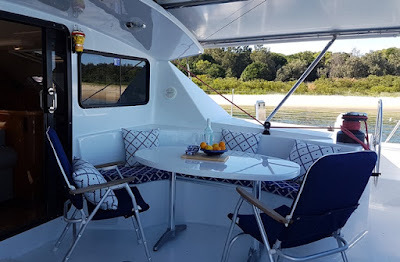 Along with the large companionway sliding doors, the expansive lounge (new) and cockpit - all but the cabins are on the same level. Galley has a new gas range (all new gas-lines) Electric convection microwave, double sink, range hood, 85lt fridge and 60lt freezer and lots of storage. 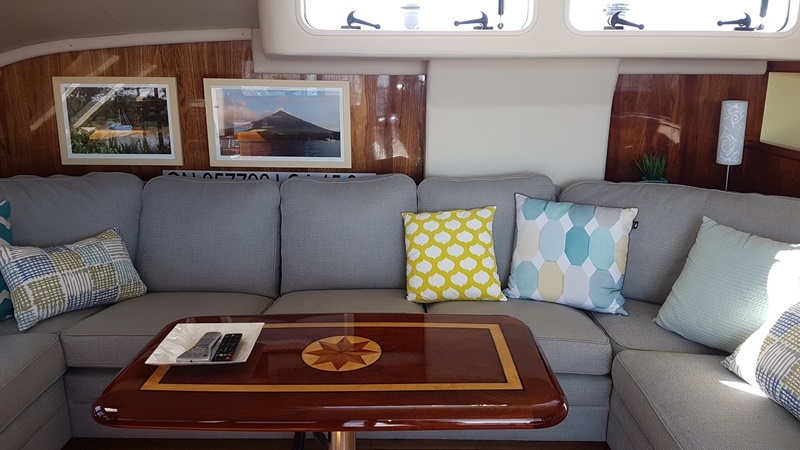 Seating for 6 on the large house-size lounge with hand laid Cedar and Madrona table, TV & Stereo make for luxurious entertaining or just relaxing. Navigation station on the port aft side makes navigation easy with a window directly onto the cockpit. 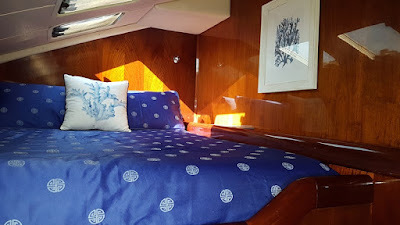 All new clears, shade covers and cushions. 85lt Drawer Fridge/Freezer in cockpit (new). · Auto and manual bilge pumps through- out. 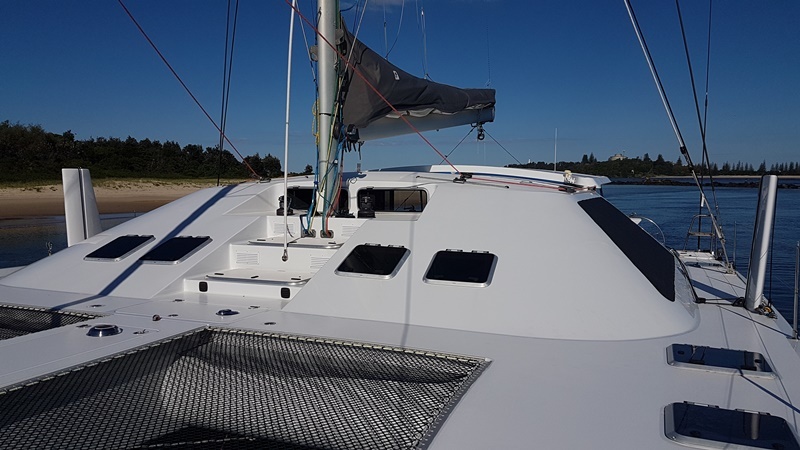 · 2 x Freshwater deckwash outlets. · 1 x 25kg Rocna (main anchor) 65m x 10mm chain with 100mtrs 22mm eight plait nylon.